The Cadillac Deville series of cars have advanced progressively over the years. The conservative generations that reined the market from 1949 to 1993 were base level vehicles that transformed to a bolder full-sized sedan over time. The first generation (1959-1960) consisted of the 6200 and 6300 series. These had distinguishing features like sharp tailfins, bullet tail lights and a jewel-like grill. The second generation Cadillac received major re-engineering; a slanted grill, pronounced front pillars and trimmed down tailfins that made it achieve a low profile. Other generations followed with detailed transformation in the design like removal of elevated tailfin and finer body lines. In 1974, airbags were introduced for the first time in the now full-size body design. From 1977 to 1984, the fifth generation brought downsized sedans that hinted at how the future Cadillac Deville would look. They had a larger trunk, and extra leg and headroom. 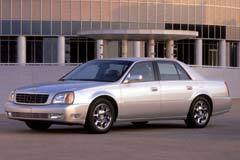 The 2005 Cadillac Deville has a complete facelift that represented the last generation of the long series. This model features an elegant, sportier and aerodynamic style with a completely revamped interior design. 1993 Cadillac DeVille 1993 Cadillac Deville - Low Miles! Excellent Condition. 1956 DeVille -RESTORED 2 DOOR HARDTOP FROM ARIZONA- 1956 Cadillac Coupe DeVille, Matador Red with 5,000 Miles available now! 1968 Cadillac DeVille 1968 Cadillac Coupe Deville “Survivor” w/ 8,700 original miles. Must see!